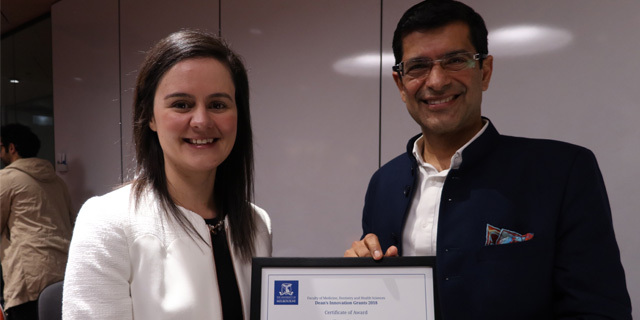 Seven early to mid-career researchers from the Faculty were invited to pitch their innovative projects to the Dean Professor Shitij Kapur and a panel of judges as part of the inaugural Dean’s Innovation Grants on Tuesday 31 July. The new grants aim to boost the Faculty’s commercial pipeline for scientific discoveries by supporting the development of innovative projects towards a stage where they are in a position to attract further funding from government, industry or venture capital. The grants form part of the Faculty’s mission to build an entrepreneurial culture and workforce that can support innovation and enterprise, a major commitment of the Strategic Plan: Beyond 2018. Dr Ada Cheung – Research Fellow, Department of Medicine, Austin Health/MMS – for an Australian Gender Health Study. The judges were very impressed with the calibre of the pitches and the quality of the underlying translational research projects. After careful consideration, the judges awarded first prize of $50,000 to Dr Laura Downie, praising her compelling presentation and the ingenuity behind her vision for a device that, if translated into a new product, could have very real benefits for clinicians and patients. Dr Matias Maturana and Dr Brendon Chua were also recognised for their outstanding projects and each received grants of $30,000 while Dr Ada Cheung received an honourable mention. All three recipients will use these grants to progress their projects and they will receive further support to build their commercial and entrepreneurial capabilities through the Faculty’s partnership with the Translating Research at Melbourne (TRaM) program. For more information about the Dean’s Innovation Grants, visit the MDHS intranet or contact Dr Premila Paiva, Senior Project Officer (Innovation and Enterprise).